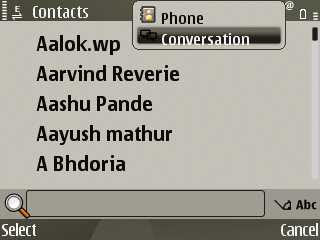 Nokia Conversations : Threaded View for your SMS Inbox . Nokia Beta Labs never fail to impress me . While Ovi gets all the attention and Media love for being a destination for cool applications for Nokia devices. some serious R&D work is being done in Nokia's Beta lab . I have been following the releases on Nokia's Beta lab for quiet sometime now . Some of them are cool, sophisticated and yet Easy to use . All most all of them deal with a basic and HUGE use case . Sometime back I had reviewed one of the Nokia beta lab product " Nokia Bots" on Lab Report . I wasn't expecting to return to writing about another beta labs product so soon ( since they are in BETA and not quiet ready for end customers yet ) but I am glad to make an exception for Nokia Conversation App. Nokia Conversation is a simple , ease to use ,No fuss app which allow you to arrange your text messages as a threaded conversations.SMS Inbox in most phone sort messages in a reverse chronological manner. this default arrangement is good when you need to check the latest message . but Anyone who has got more than 100 sms in his inbox will tell you that how difficult it is to actually find an old SMS and make sense of SMS conversation happened in past. You can download the application from Beta Lab website (registration needed) . file size is 123 KB and you need to side load it on to your device , using your PC . 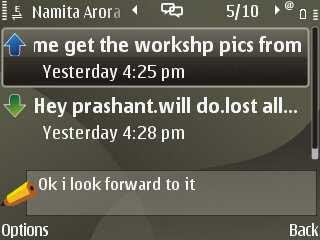 I Installed it on my Nokia E63 .Installation was smooth.Nokia Conversation doesn't replace your default SMS inbox UI. What it do is simply to provide a diff rent view of it ,When you need it. on launching the application there is only a single screen where messages are grouped in threaded format according to sender-receiver . you can choose to expand any of these threads by clicking on them. you can also reply and carry on the conversation right form the application you don't need to launch a separate editor.you can also add different media like Picture, Video , Audio to your message by clicking on the "Option " menu. The application shortcut also appear in your device as a new tab in your Contacts application. You can also set the application to be a short-cut key (e.g., left-soft-key or right-soft-key) or standby application icon in the Settings menu option in your terminal. I wanted to retrieve an old SMS Conversation today , frustrated by the difficulty of finding it from the sea of 500 SMS. I googled for such apps and finally hit upon Nokia Conversation . My instinctive reaction after using the app was To use an analogy from inter web . to quote verbatim " Nokia Conversion transform your Inbox from a outlook/hotmail like look to a Gmail like look." and we all love Gmail don't we ? Do try this out and let me know your thought ? Auto On : To Keep your Mobile App "Always On "
When it comes to Mobile Apps ,one problem faced by power users is the problem of abundance . As I write this,there are 70+ applications installed on my device . I don't use all of them with same frequency. Some are used daily , some once in a while and some I use strictly when need arises which can be anything from next minute to next year. But when you need to use them at that time finding the application from the stack of icon and launching it is a pain. Say I am driving down the highway and feel like looking at my Ovi Map for direction or do a voice search using Google .But both these apps are not launched at that time .I need to do it manually. Ergo for a long time I was looking for a solution where I can choose which application to launch at the time of starting phone. some apps automatically launch them self. My e-mail client from NMS have in-built mechanisms to launch themselves every time my device starts but for rest of the apps I have to manually launch them. Auto -On from Gurgaon based Migital serves exactly the same need. 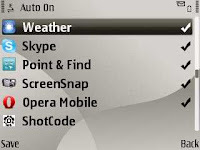 Auto On is supported for Symbian series60 3rd edition and 5th Edition touch devices. you can buy it from Ovi store or get a trial version from Migital Website . I downloaded the trial version and side loaded it on my Nokia E63 . Installation was smooth . When you install the app it automatically activates itself such that it will run when you boot your cellphone.If needed You can also deactivate it. 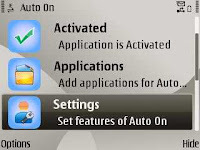 After installation you need to configure the detail of apps you want to include in Auto-On's self start list. This can be done by going to application icon on the home screen of Auto On . Initially you will see a blank list. You can populate this list by going to "option" menu and selecting "Add". this will show you a list of every app installed on your device. you can mark your preference by clicking on the icon of application which you want to include .I selected some 8-10 application for self start . Some of them are shown in screen shot below . I restarted my device and Bingo !! those apps were ready to use . Auto-On worked as advertised :) . Its my second day of using auto on. Since I was greedy so I selected a lot of apps initially . which took a lot of cellphone memory and slowed it down. Going further I hope there will be a feature which can show me implication of selecting an app in terms of Memory consumption so that I choose only those apps which are essential to me . A similar feature for battery consumption ( things like Always-On GPS is a huge drain on battery ) would also be nice to have.One unique selling point of Auto On is its look and feel. their UI is too good for a utilitarian application which will most probably be used only by power users.Kudos to Migital team for such a nice job. Do try it out and let me know your thoughts . 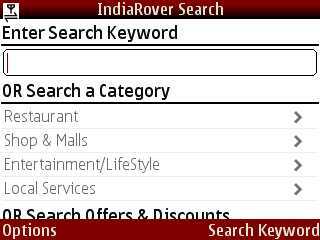 IndiaRover : Your Freindly Neighborhood Search App . Sometime back I reviewed Zook, a mobile search application BY Ziva software. Zoosk is a horizontal search application,which starts from generic web and filter out result which are optimized for Mobile phones. That's a huge market to address But there are many use case of mobile search where you don't need complete data of world wide web as a starting point.At times you want vertical search , you want to focus your search query oo a particular domain like Hotel,travel,food,stock quotes,news,dictionary,Wikipedia etc for such use cases You need a small,locally relevant data set which is domain specific. One such use case for mobile search is hotel and restaurant search. Anyone who has ever felt lost in a new city will testify for this need. Often time on weekends I feel like exploring some new stuff in my town but don't know where to look for such info. Similarly if you walk past a newly opened eating joint at your neighborhood shopping mall you feel like reading its review before trying it out . Google search looks too big for such needs . Its like searching for needle in haystack. India Rovers Mobile application is trying to address this latent need only . Need of a mobile friendly search interface on top of a highly targeted,locally relevant and regularly updated database of local businesses around you. 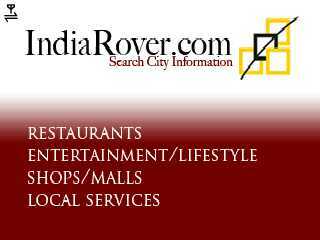 India Rover in its Internet avatar is a city search site . their mobile app serves the same function on cell phone . 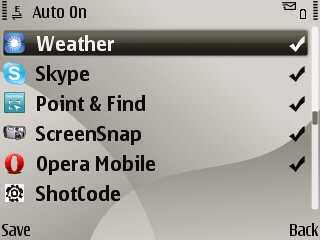 Its currently supported only for symbian phones .you can download it from Ovi store (link) . It took me 3 minute to download it on my Nokia E63 from Ovi Store . installation was a smooth process with no need of registration or providing personal details. you are ready to use it after that. Home page of application consist of a search box on the top where you can search by keywords. beneath the search box there is a category wise directory listing of database. 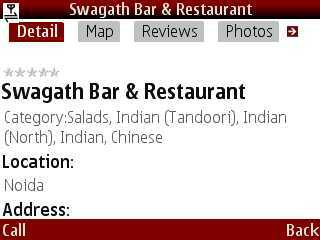 These category include sections like Restaurant,Entertainment ,local service etc.each category is further segregated in to various sub section. like restaurant category offers classification around cuisine, shopping category offers section for various type of product like clothing , electronics ,jewelery etc. I liked the granularity of this classification . I checked the amount of data available under some section , there was sufficient business listed in most of them. In the bottom of home page ,there is a section for deal hunting where you can search for offers and discount in your neighborhood . When you launch the application it determine your current location so that it optimize the result listing for you. for using the keyword search you need to type in the keyword and press right soft key. it doesn't shows the listing directly it ask you to select your current city from a list followed by a request to choose preferred neighbourhood after that you get to see a list of result. I searched for pubs in Noida (its Saturday after all :) ). it shows a list of local watering holes . you can expand every entry to get its detail. detail page of every joint is very detailed and UI is very clean. It offers address,contact number,timings,Map,pics and reviews of place.Review section was mostly empty but since they allow you to post review of your own so I hope this will change as more and more people start using it. Another nice feature of detail page is that on this screen left soft key is mapped to the phone number of restaurant listed here.You can call the restaurant by simply pressing the left soft key . I personally find it very convenient .In discount section the data is organized in similar fashion . from the first look it seems that all the discount listed here are not exclusive to India Rover community .these are walk-in discounts . But that doesn't negate the value of having them all at one place for quick and comparative decision making . As someone who spend a lot of money ( lot by my standard ) on suboptimal deals I intend to use THIS feature a lot in days to come. Much of adaptation of such application depend upon two things (1) Richness and relevance of data (2) ease of use of interface. On first count IndiaRover score a home run .though its not obvious from their product info that whether they are creating their own data or buying syndicated data or betting on community to fill the data . Honestly it can be a mix of all three approach .I think it will be a good idea if they partner with review sites or discount coupon disbursement sites or aggregate review published on third party site . This will greatly enhance the value proposition for end user.On user interface front I find their UI and work flow to be light weight and intuitive . There won't be much of a learning curve for average user. only thing which I found a little out of place was their choice of Right soft key for triggering the keyword search .It might be a matter of personal preference but this key-to-functionality mapping was less than intuitive for me.I would love to know how rest of you feel about it . I found India Rovers mobile app to be a decent attempt to solve a problem we all face.it will be interesting to see how the product evolve in future .I will keep you posted .Do check it out and let me know if you got a good deal via India Rover. Enjoy your weekend ! Mobi Watchman :: Live your Life. Let Watchman do the vigil. Some time back I made a post on Lab Report discussing the need of innovation in those category of mobile application where market is already evolved and crowded . Usually start up avoid such crowded space unless they have something extraordinary feature set to differentiate their offering from the clutter . Its not an easy task but its a worthy goal nevertheless. For with evolved category comes a validation of customer need , pre existing user awareness, distribution Chanel and willingness to pay for the service offered. When it comes to Mobile Apps this phenomena is most visible in the category of SPAM Manager & call manager application. Heated discussion on my post about XBlockr is a testimony of that . Today I am going to tell you about one more Indian application in this domain : Mobile Watchman . Developed by Pune based Optinno Mobitech, Mobile Watchmen is an App that blocks calls and SMS as per user's settings. This application runs in the background so that regular mobile phone tasks are not affected.Mobi Watchman uses a proprietary algorithmic logic to intelligently sense the spam. user can also define the parameter with in which this algorithm works . You can download the application from the download page of their website .It cost Rs 199 only . There is no try and buy functionality available as of now .To buy this app you can pay by online using your cerdit /debit card. On realization of payment they send you a product key via email. You also need to provide IMEI number of your device. The installation file your get is linked to your handset's IMEI number. I downloaded the installation file on my PC . It was of 523 KB in size . I side loaded it on my Nokia E63 . Installation was a smooth 3 step process . After installation it asks me to punch in the product key.after that you are ready to roll. Mobi Watchman allow approach the problem of spamming in two ways . SMS Spam and Call Spam .If you receive an SMS from a number not stored in your mobile phone book or from a sender not mentioned in your ‘Trusted SMS Sender’ list, you will see a ‘Suspicious Message’ pop up. 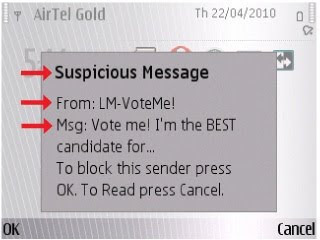 Just by pressing ‘OK’, you can directly add the sender in SMS block list. Note that you can see a preview of the SMS content. So without opening the SMS, you can decide to block the sender from the pop up itself. You have functionality like Trusted SMS sender's list where you can provide the detail of all those number who are not spammers. When you receive an SMS from a number not stored in your mobile phonebook or from a sender not mentioned in your ‘Trusted SMS Sender’ list, you will see a ‘Suspicious Message’ pop up. Just by pressing ‘OK’, you can directly add the sender in SMS block list. You can block messages using keyword based filtering too . For instance I hate receiving promotional messages from Real Estate developers( Not enough money :( ). so I can block any SMS which is coming from a unknown number and has got keywords like "FLAT" ,"3 BHK", "Noida" in it .I have configured 5 such filters on it since yesterday . This was the kind of granular control I was always looking for . You have similar control for phone calls too .If you receive a call from a number not stored in your mobile phonebook, you will see a ‘Suspicious Call’ pop-up at the end of the call. 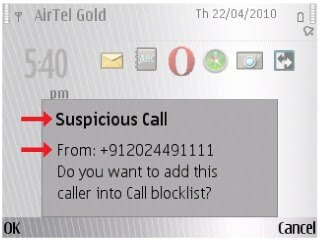 Just by pressing ‘OK’, you can directly add the number in the Call block list. You can block them by defining policy for unknown fixed line number,unknown cell number etc . Mobi Watchmen also offer an Seamless Integration with phonebook, call logs, SMS inbox. so that you don't have to manually enter the number in block list.You can access the detail of block sms and calls later at your own convenience .They are stored in ‘Bin' folder and block call list respectively . A detailed list of the functionality is available on their website (link). Mobi Watchmen is a thoroughly researched and elegantly implemented mobile application . This is a quite an impressive achievement given the fact that its a version one of their application. I am sure their will be a lot of cool feature to be added in subsequent releases . Personally I find that they need to work on their sign up process.Their should be a provision for receiving your product key on SMS and installing your app direct on your device . I am sure these issues will be addressed in days to come as they collaborate with Ovi Store and other distribution medium. Do try this out and let me know how you feel about it ? Ovi App Wizard : Let A Thousand Application Bloom . One of the most underdeveloped component of mobile software stack is mobile browser. While last few year has seen immense growth in the hardware capability of device and user experience in mobile applications. But things still remains less than perfect on mobile browsers front. In addition to browser capability there is a problem of Majority of the web pages on internet not being optimized for rendering on mobile devices. That’s why most of the leading blogs and other websites have their content available via Applications on various app stores. Mobile App is an efficient, elegant way of ensuring that Good content is delivered to user with great user experience. But creating a Mobile app is a complicated and expensive proposition .Very few publishers have resources and bandwidth to developed an app for their publication. It's next to impossible for non techie users ;for instance there is no way in hell that the lady next door to my apartment ,who publish a culinary blog for documenting her recipes, will ever think of doing that. To mobile optimize the internet content in any significant manner we need an easy to use, rapid application development (RAD) tool which enables anyone to create an application. Ovi App Wizard from Nokia is an attempt in that direction. The Ovi App Wizard allows you to mobilize content with just a few clicks in just a few minutes. RSS and Atom feeds for blogs, YouTube, Twitter and news are formatted into a WRT or Java application for your Nokia device. These apps work on most of the device that supports Ovi Store. The whole process of creating application is simple, fast and intuitive. You can start by simply pointing your desktop browser to http://oviappwizard.com. You need to register yourself to publish the application .you get an OVI Store Publisher account on submitting your app through App Wizard. Registration is simple, you need to enter few details and it sends you a confirmation email immediately. You can immediately start working on your app. All you need to do is to provide RSS feed /web URL of the site for which you want to create application. On the right hand side of page there is an emulator which shows a preview of how your content will be rendered in final application. You can also add extra feeds from your Twitter, facebook and YouTube account to it. You need to press "Next" button to proceed further. It shows a pop up dialogue box with legal disclaimers and content publishing guideline. It essentially says that you are rightful owner of content you are publishing and it doesn’t contain any offensive, pornographic material. In next step you can customize the look and feel of your app by choosing a logo and changing color scheme of your app.In subsequent step Ovi Wizard offer you a choice to monetize your app by adding advertisement to it. Right now this choice is limited to two ad networks Millennial Media or MPressions .you can choose to opt out of it. It’s entirely at your discretion. In the final stage of the process you need to provide little description of your application, which will appear on Ovi download page of your app. You also need to choose a category under which your app will be listed. You can limit the distribution to a certain geographical user base by choosing an option from target market. You can choose any price point from Free to up to EURO 5 per download. Press submit button and your app is submitted to Ovi store for review and approval. Depending upon the number of submitted apps, it might take anywhere between 24 Hrs to a week in getting necessary clearance from Ovi .After that your app will be available for download via Ovi store. Ovi Wizard is a commendable effort by Nokia to bring mobile publishing to masses and bring mainstream acceptance to Mobile application. If executed well it holds the potential of creating a huge amount of Mobile optimize content. If I have created an app for Lab Report, its awaiting approval right now, I will inform you when it’s available for you to download. Keep watching this space. Do try OviWizard and let me know your thoughts about it.